But that is changing as evidence builds that taking brief activity breaks during the day helps children learn and be more attentive in class, and a growing number of programs designed to promote movement are being adopted in schools. “We fall into this trap that if kids are at their desks with their heads down and are silent and writing, we think they are learning,” Mr. Gatens added. “But what we have found is that the active time used to energize your brain makes all those still moments better,” or more productive. A 2013 report from the Institute of Medicine concluded that children who are more active “show greater attention, have faster cognitive processing speed and perform better on standardized academic tests than children who are less active.” And a study released in January by Lund University in Sweden shows that students, especially boys, who had daily physical education, did better in school. “Daily physical activity is an opportunity for the average school to become a high-performing school,” said Jesper Fritz, a doctoral student at Lund University and physician at the Skane University Hospital in Malmo who was the study’s lead author. But not all districts are embracing the trend of movement breaks. “The bottom line is that with only six and a half hours during the day, our priority is academics,” said Tom Hernandez, the director of community relations for the Plainfield School District in Illinois, about 40 miles southwest of Chicago. He said that under state law, the schools provide daily physical education classes and that teachers in the district find ways to give students time during the day to refresh and recharge. Mr. Boyle’s association has introduced a series of three- to five-minute videos called “BrainErgizers” that are being used in schools and Boys and Girls Clubs in 15 states and in Canada, Mexico, Ireland and Australia, he said. A version of the program is available to schools at no charge. The program is designed so that three to five times a day, teachers can set aside a few minutes for their students to watch a video and follow the cues given by the instructors. In one typical video, the instructors are college students of all shapes and sizes at the University of Connecticut who do a quick warm-up and then lead kids through a mini workout involving movements from several sports: baseball, basketball and a triathlon. That’s followed by a cool-down. Julie Goldstein, principal of the Breakthrough Magnet School in Hartford, Conn., said her school has been using BrainErgizers since the spring of 2015. Scott McQuigg, chief executive and a co-founder of GoNoodle, a classroom movement program used in more than 60,000 elementary schools in the United States credits Michelle Obama’s “Let’s Move” initiative with helping to bring movement and the health of children into the public consciousness. 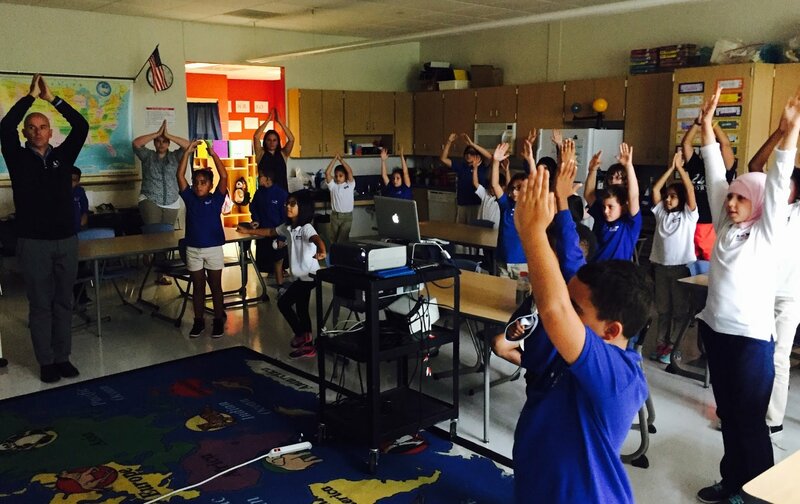 GoNoodle, which offers free and paid videos, aims to entertain kids while they are moving, Mr. McQuigg said. GoNoodle and other “brain break” videos can be found on the website for “Let’s Move! Active Schools,” part of Mrs. Obama’s “Let’s Move!” initiative. For example, GoNoodle videos have kids running alongside their desks through a virtual obstacle course or following along with dance moves. Joseph E. Donnelly, professor of medicine and director of the Center for Physical Activity and Weight Management at the University of Kansas Medical Center, said one of the good things about kids being more physically active in classrooms is that everyone is moving at the same time. Lindsay DiStefano, an associate professor in the department of kinesiology at the University of Connecticut, said the country is due for a major shift toward appreciating the benefits of physical activity in the classroom.